Hey everyone! 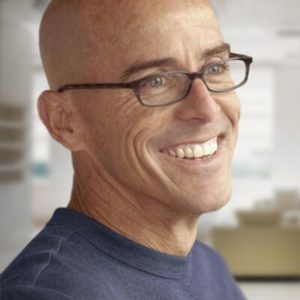 Today I share the mic with Blake Irving, CEO of GoDaddy, an Internet domain registrar and web hosting company. Tune in to hear Blake share how he helped propel GoDaddy’s revenue from a billion dollars to two and a half billion dollars in four years, how GoDaddy has transitioned from being a US-centric company to a global organization, and why recruiting top-quality leaders was instrumental in scaling up the business. 08:13 – Over the past four and half years, they have entered new markets, introduced new products and have grown revenues to 2 and a half billion dollars! Recruiting top-quality leaders is the right way to SCALE your business. Acquiring another company is a great way to ACCELERATE your growth; critical to do a proper “build, buy, partner” analysis to decide the best course of action. A well-trained customer care team that is emphatic to a customer’s problems helps you find success in the marketplace. And had a conversation with a couple of board members after and said, "I think I'm interested in this I can imagine this could be pretty big." Couple board members, it was two KKR board member said, "What do you think you'd do with a company?" I said, "Well, I think I'd take it global because it's grown revenue in the U.S.and I think there's a huge opportunity for the need state outside of the U.S."
You'd take it globally, you'd flatten the platform because I can tell that there's some technology that's not used ubiquitously by all the products in the company. API it so you could bring on partners. I'd square up the marketing messages with who we are and who we are as a company what we do and who we do it for. And then I'd have to open I think, tech centers in places where we think the greatest technology talent is, so we could build a platform out and the products. Both of the response from the KKR our partners were, "That's our investment thesis so that sounds pretty good, so maybe there's a maybe there are some further conversations we should have." From there I talked with some other board members and had conversations or that were quite similar. Met the interim CEO, Scott Wagner, who is now our president chief operating officer and was a KKR operator. Really smart guy and really fun to work with and spent time with him and told him what I thought was happening inside the company he said, "That's exactly what's going on and your premise on what we could do this place is absolutely right. We could blow this out internationally, deepen the product portfolio, broaden the park portfolio, partner with folks as we API'd it." And last interview was with a founder, Bob Parsons, which was a full day interview and had a really wonderful time talking with him about how he built the business into a billion dollars. What his concept was and how to grow it. And I shared with him what I thought and how I went about doing that kind of thing, and at the end of that process I ended up taking the role. And for the last almost five years now have been digging into the strategy that I just ... that I told the board that we were going to endeavor on. Over the last four and a half years we have entered ... we have flattened the platform on top of OpenStack. Updated many of the products across the products' suite, have entered 56 different markets, have more than 50 payment types now, have grown revenue from a billion to about two and a half billion. So more than doubled revenue, we have more than doubled our earnings, more than doubled our cash flow. We have gone from 10 million customers to 17 million customers and continued to stay on that trajectory. Things are going well we've opened tech ... technical operations centers in Sunnyvale San Francisco. Already centers Sunnyvale San Francisco, Cambridge Massachusetts, Seattle Kirkland Washington area. We've opened care centers in Belfast in Dali in China, in India to serve the Indian marketplace and we now have a chat sports center in Manila. And it's just been really deep growth, building out the product lines and we've introduced some pretty cool products in the last year and a half or so and still have more coming. Eric Siu: Awesome, incredible, right? Congratulations on the growth but one thing I think about just right off the top of my head it's like the transition from your Chief Product Officer to CEO I mean, kind of, what's going on in your mind when it's like, hey come run this billion dollar plus a year company I mean, how tough was that transition? Blake Irving: It wasn't really tough when you surround yourself with really great people. You know, I had Scott Wagner who was operating the company's interim CEO incredibly great operator. And I just basically started calling folks that I knew would be then ... when I tell him the story of what I found at this company, would be so interested that they'd probably joining to. I just had this hit list of folks that I wanted to have join us. I think when you're building a company that has the capability to scale, you do it with people that you know can scale it with you. And so I basically recruited a bunch of top quality leaders that have then started recruiting top quality leaders themselves, and started building up the business. So I think it would have been scary had I not been able to put together a team that was unbelievably strong and able to both build out a platform, globalize products, build great sales mechanics and maintain the people that were in the company that were incredibly good at what they do, both our general counsel or CMO or marketing team, really amazing. Some of the IT guys are incredible and now we just needed to add products and technology and platform capability to it, and we were able to do it. So I think I approached it as a primarily as a product and technology problem first and I think sort of a branding sentiment problem in the technology industry, so we could capture web pros and broader customer base. But wasn't ... honestly it wasn't that scary it was different but the size of the company was a little bit smaller than my product groups of either Microsoft or Yahoo. So the scale of people was about the same and the scale of the businesses in around the both of those companies terms of building you know product and building on profitability was about the same or a little bit larger. So I felt pretty comfortable on the scale side. I just needed people to come on board and grow with me. Eric Siu: Got it. And what was your pitch? I mean, you know, lets say you're looking to get that CMO. I mean, what was the pitch to say, "Hey come join Go Daddy." What really attracted them? Blake Irving: Well, the same thing that attracted me it was like, oh my gosh look this company has built a billion-dollar business without I think, what I'd call traditional product investment and technology investment. And they've done it only in the United States. What would this look like if we could go build out a global platform for small businesses? And I told them who the customer was. The customer are guys like you who are solopreneurs or have small teams of people that are figured out on their own. And this the size of the market, the TAM is absolutely huge if you penetrated this in a way that nobody else had done globally. We could get these tiny businesses that are intending to grow to be larger, to be you know to be their platform. And nobody else has done it, Amazon hasn't done it, Google hasn't done it, Microsoft hasn't done it and if we've single purposefully build this company to service the small business person and somebody who has an idea might just want to stand up a website even temporarily. We could absolutely grow this thing to be two times, four times, 10 times the size it is today. And people started digging in when I'd call him and say, "Go use the products, come talk to some folks in the company and tell me what you think." And to a person my hit list of folks that I wanted to join, they joined and brought folks with them, with the exact same pitch. Eric Siu: Love it. Great. I mean, I remember back in the day Go Daddy I mean, the perception was that good, it seemed to be kind of a really aggressive culture and then I mean, now it shifted more toward focusing on a small business customers. I mean, what did you have to do to kind of shift everything over and what were some challenges that you faced? Blake Irving: The interesting thing was, the folks inside the company, Well, there really are two brand realities. One brand reality was how the company was representing itself in advertisement on T.V. and that's what most people thought of the company. They saw the advertisement said. "Oh my gosh these are you know, it's an aggressive marketing company and [inaudible 00:14:00]. Boy these ads are really edgy, they make me uncomfortable that must be what the company is like." The experience you had when you met the employees was totally different. They care deeply about their customer. Were really into the small business person and of the folks that have ideas. And so I think shifting the company was about asking questions about what folks in the company wanted the company to look like. What do you want us to be? What do you want us to ... how do you want us to represent ourselves in the market? And I've had a ...I think I was predisposed to want to have the company show up as you know a company that provided great value to our customer. I think getting the company to shift in that direction was pretty simple once you actually started to dissect who the customer was and found out what their customer needs were. And then try to maintain Eric, that sort of edginess that existed in the advertisement but then put the customer front and center in those ads. So it wasn't so much about shocking or provoking to get brand awareness. When you have 80% brand awareness, you don't really need it and need anymore. You need to tell people what you do and who you do it for, so that was the direction that we took it and frankly getting the company to follow. They were all in already, I think there are a lot of folks in the company who really wanted to do that. And tell people what we do and who we do it for. So taking those first ads that were kind of funny and provocative still but not having them represent that shock at all the Go Daddy on the map and created a brand awareness, which didn't have to do that anymore. And the company ... the people in the culture inside the company said. "This is awesome this is we love representing ourselves in this way and we can be proud of it." Eric Siu: Love it, I want to shift gears to, you've mentioned ... before you joined you mostly focused on the U.S. and that since then you've gone global. So what are some lessons that you've learned going global? What are some challenges that you face as well? Blake Irving: I think lessons learned is, it's hard to take and I’ve known this because I had to do it in other companies. But It's hard to take a code bases that are written specifically for U.S. market and transition it to a global code base. When you think about code, you separate code into really a few things. You have the function of the code, you have the language of the code and then you have the market. Function is what it does, language is what are you going to read, if it's speech recognition it’s going to read back to you. And then market is a combination of payment type, currency and language vernacular and images. You actually have to build your code in a way that you can modularize that and make it very simple to do builds where the images that show up in Chile, are going to look very different than the images that show up in Argentina. As are the payment types, as is the currency because you have to be very, you want to appear from a software perspective to be in that market just down the street from them. And if you put a Chilean flag on an Argentinean website, they're not going to think you're very local and so we were really tight on doing that and frankly that took longer than I would have hoped. We did it pretty quickly, but still you know we factor in code base and we factor in our econ system to manage that many different currencies and payment types is pretty damn tough. The other thing we learned is that once you've entered a market, you have to determine how you're going to tier your markets. We tier our markets in three levels. Tier one, which is worthy of boots are on the ground and I'll call it top of funnel marketing using T.V. radio, sports, sponsorships, those type of things. Tier one are markets that are large enough from a population perspective in large and fast enough drawing from an internet perspective that it's worthy of the investment on the marketing side. Tier two is a smaller market that has fast growth but doesn't have a population that's quite as large, and so you invest in mid funnel marketing there and you hope that those tier one markets, and our tier one markets are good Canada, U.K. Brazil, Mexico, the United States and India and Australia. Those are our tier ones and we invest the way I just described. And then you hope those investments breed into peripheral tier two markets, where we spend mid funnel marketing dollars, and we’ll spend on search some display retargeting but primarily steady on search. That's the tier two market. One of the things that we learned after rolling out all those markets is you got to spend and go deep and actually spend more time and attention going deep into those tier ones and turning tier twos into tier ones than we had originally thought I think. We actually have hired marketing teams in those countries that are now focused on building them out. Another thing that we did find was that, while you're growing share in a market, use Europe as an example, we were pretty happy with our growth in the U.K. and the Continent. Continent wasn't growing as fast as U.K. U.K. was growing at a really good rate for us. You can accelerate by acquiring a company that is in a similar business. And while we were making headway we knew that we could advance our growth pretty dramatically by buying somebody in the market. In December of last year we announced that we were purchasing a company called Host Europe group that would then become Go Daddy in Europe for us. They'll be focused on Europe, the Middle East and Northern Africa. And basically focused on growing those markets for us and we you know, picked up we spent 1.8 billion in December for Host Europe group, picked up 1.7 million customers and a heck of a good business for them. Honestly had we grown faster would we have done that completely organically? Maybe. But honestly the synergies between Host Europe group and us were so tight and so well aligned both culturally and from a business perspective we thought that we could synergistically grow the business much more quickly and actually use Host Europe group as sort of the ... we think of them as being our European headquarters running the entire brand portfolio in Europe that's what we've done. There may be other opportunities to do that again in Latin America, in Asia, other parts of the world as well. Eric Siu: So what's the process for buying a company for 1.8 billion? What’s that typically look like, do you just rendezvously have your M&A team reach out to somebody, like how does that look? Blake Irving: No. You continually scan the environment for folks that you think are running a good business, and are strategically aligned with where you think the market will go over the course of the next five to 10 years. And then you think that there's a really good business there that you can pursue and grow. We've done quite a few acquisitions over the last four and a half years. Most that have been technology tuck ins, this is the largest we've done. The rationale behind most of these things are to do a build by partner analysis to say, "Boy am I better off partnering with somebody building this capability inside or acquiring it because I think I can get a leap of a time by buying them." We scan a number of different markets and we really scan two particular things, technology we think that our customers really want and then a geographic advantage that might give us an acceleration of growth. We've looked at quite a few companies that are in the same space. Honestly we talked to Host Europe group for a year before we acquired them maybe even longer than that. And had a very long due diligence process, got to know the leadership team, really liked him, did that on a casual basis and got tighter with them and then started actually getting down to some pretty deep numbers, and what we think it could look like and what a synergy model would look like. You have to get to know the people really well to be able to do a successful job with an acquisition and then when you're like minded around what you think the business would look like going forward then basically get down to negotiating price and those types of things. But first you're trying to determine whether you think you are more powerful pull together than separate and that there's a good economic outcome for all parties involved. Eric Siu: Great. What is the secret weapon to Go Daddy success? Blake Irving: You know, I think there's been ... there's been two. One is the brand. I think because the brand has been so well recognized that when we show up in a market using in Asia as an example, folks know who we are. Many in the tech space know what we do, so when we show up they know what to expect. That's a huge advantage to us. Another, something that you wouldn’t expect from a tech company is our customer care organization. We have 5,000 people in our care organization who have over a million and a half phone calls with our customers every month. And I guess I'll call it net promoter score or the customer satisfaction is absolutely off the charts for not just a technology company, any company that provides support by phone. We spend time on the phone with our customers solving their problems fixing things that may not even be our problem maybe it's trying to help somebody set up email on their iPhone or solve an iPhone problem. While we are in the process of doing that consulting with them, and helping them figure out what they need to do next to be successful with whatever they're trying to achieve with whether their web presence, or their business, or their nonprofit or whatever it is they are trying to get it done online. The care organization is 5,000 folks are a profit center for us and they're responsible for 25% of our revenue. That support organization is something that very few tech companies ever would have built and I think that our founder Bob Parsons had great insight into the human nature of somebody doing a startup having been one of those guys himself, and said you know if I talk to these people when they're at a point in their life cycle and this is a life cycle business. When they're uncomfortable or don't have all the answers and we can help consult with them and solve their problem and get them on to the next thing, they're going to treat us really well and if they're with us for you know a couple years they’ll stick. And that's what you know, we've got an 85% retention level on all the products. We are getting much better and more solid things like our Go central Do it yourself website builder or our smart line, a second line telepathy product for yourself. Those things are getting better and we have a support team that just backs them up a hundred percent and makes our customers lives easy. Eric Siu: That's the second thing I was trying to dig at, the secret weapon being your reps, so why do you think your customer service reps are so successful? Blake Irving: You know, I think we train a very, very carefully. So they understand how to dissect the needs state of the customer, have a really casual conversation with somebody. Kind of assess what but problems they are having, solve them as quickly as we can and then help them figure out what they want to do next. And do it in a way where they feel like we really care. And you know the fact of the matter is we do, we don't you know, basically time our reps to say you got to be off the phone in five minutes. It's like solve the customer's problem, make sure they feel that they've been treated well and then end the call but make sure that these folks feel like they've been helped. The one powerful thing in our business is recommendation. And recommendation probably the strongest marketing tool you have. We want every one of those calls to end up being, “Yes I'm going to recommend this company because of the interaction that I've had.” And I think it's incredibly important to make sure that you understand your customer, that you train your employees to be empathetic, to be an ear that is trying to figure out what the customer really means when they're trying to define a technical issue, because our customers are not technically sophisticated for the most part and taking them to that next step where they can feel like we're invested in their success. Eric Siu: Great. Just a few more questions as we wrap up here I mean what's one new tool that you've added in the last year that’s added a lot of value? Like Evernote. Blake Irving: You know, I think ... if I think about smart line and I don’t know if you've tried this but it's a super cool app that sits on your Android or iPhone and it adds a second phone line to your phone when you have an internet connection. It basically if you think about small businesses, they're trying to build a web presence. They're going to go start up a website, they're going to put a phone number on that website. They should never put their personal phone number on the website, so what we did is we basically had customers telling us on the phone, “Your support is so amazing, you guys are thought about going into the phone business because I need a second line and I don't want to pay whatever phone company that mention to for another phone nor another phone line because the service is so bad, I'd rather have you guys do it.” So we were getting told by customers we had to go onto this business. We acquired a company over a year ago called Freedom voice who was already in the business. We architected their Go to market so it was more about less lines in offices and more about doing an IP switch that would allow a cell phone to have a second line on it, and frankly when it comes down to put on a phone number on your website, just put a smart line number on it. You can pick the area code soon you’ll be able to pick an 800 number you'll be able to pick vanity names, it'll have texting within the next four weeks so you can text from that number with your customers and you never have to put your personal number on a website or have your personal information at risk. That's a super cool product that we've just soft launched. There are 4,000 people using it today, we’ll launch that in a big way in September and then we also have a product called Go Central, which is a super simple D.I.Y. website builder, where you can build a website from your phone or from a P.C. and it's incredibly powerful and powerful as well. Eric Siu: My God you guys are adding all these new products that I've never even heard of and I have a Go Daddy account just didn't know so everybody that has a Go Daddy account go check. Blake Irving: You gotta go check it out. Eric Siu: Yeah. What is one must read book that you recommend to everyone? Blake Irving: You know, there's a book called The Power of Habit by Charles Duhigg. Simple read book about just how to build positive habits that can be I think I what I'd call you know whether in your personal life or whether in your business life to help you build you know, have a loop that can build your success and that's one I mean there are so many great books out there. Eric Siu: Alright, so Blake this has been awesome. What's the best way for people to find you online? Blake Irving: You can ... I'm on Twitter @BlakeI. I’ve got a Facebook page public page [email protected] is my email inbox is always open. Eric Siu: Alright great thanks so much for doing this. Blake Irving: Thanks Eric, appreciate it. Announcer: Thanks for listening to this episode of growth everywhere. If you loved what you heard, be sure to head back to growth everywhere.com for today's show notes and a ton of additional resources but before you go hit the subscribe button to avoid missing out on next week's value packed interview. Enjoy the rest of your week to remember to take action and continue growing.